The heat grows more intense as we gain the top of a long ridge winding eastward. 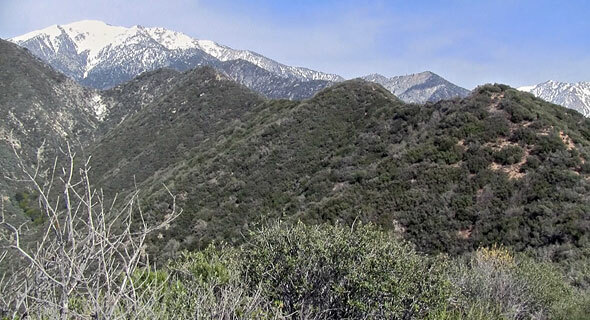 Mount Baldy's snowy west face gleams in the distance, far above us. Heaton Flat Trail follows the spine of the ridge here, contouring up and down over numerous small summits, forcing us to repeatedly gain and give back the same ground. We are now some 2500 vertical feet above Heaton Flat, heading toward Allison (also called Heaton) Saddle, a low notch that will cost us yet another 300 vertical feet or so. The trail has become decidedly more primitive. Scrub brush and Manzanita intrudes ever-closer, and soon we are battling an endless gauntlet of overhanging branches that grab our ski tips. We dance and jiggle our way through the branches and brush, twisting and turning, dipping and bobbing, trying to free ski tips from brambles only to see them caught yet again. The heat is oppressive. Our late start time is punishing us without mercy. It feels like we're carrying skis across a long, hot, bone-dry desert—which, in effect, we are. The final high point along Heaton Flat Trail before the drop to Allison Saddle begins with a steep climb up a lengthy section of loose dirt. As I start up it, I feel the muscles in both my legs suddenly flutter. My first reaction is disbelief, followed quickly by profound alarm. We are bouncing around 4700 feet in elevation right now—pitifully far from Iron Mountain's summit. I slow my pace and change the mechanics of my stride, trying to assess what's happening to my legs. The truth is I already know: my quads are cramping. How much farther is it to Iron Mountain's summit? I mentally run the numbers, quickly calculate the dismal result: there is almost no possibility I'll be able to make it all the way to the top today. And camping anywhere else along this dry, snowless, waterless ridge is out of the question. Both Lou and Dave are up ahead somewhere, out of sight. I figure they'll probably be waiting for me at Allison Saddle. As I'm forced to slow my pace to a pitiful crawl to keep my legs in check, I realize I'm going to have to tell them I've got to turn back. I want to believe I'm just dehydrated, that I've sweated out all my salt, but the fact is I'm carrying a crushingly heavy pack on a 140 pound body and it looks like I've just reached my limit. After all the planning and scouting and effort to get here, the prior attempts, the mishaps and adventures, I am devastated to be forced to give up now. But what else can I do?